What is the best material for my new stone countertops? This is a question I get asked a lot. Choosing the material for your new countertops can be a daunting task. With so many choices in solid surface countertop materials, countless color choices and several different textures to choose from, it’s no wonder people get overwhelmed. While no surface is right for every situation, some are better for the real world. 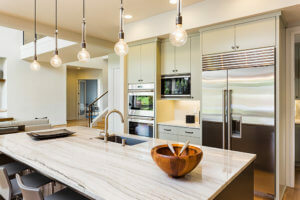 The general consensus is that Quartz countertops are more durable than granite or marble, at least partially due the fact that Quartz is so much harder (twice as hard as granite…much, much harder than marble, travertine, slate or soapstone). Quartz countertops are a combination of natural and man-made materials that are combined and formed into sheets; whereas granite, slate, marble, travertine and soapstone are quarried as slabs and polished or honed to the desired finish. Quartz is also maintenance free, non-porous and attractive. However, the discerning eye may still find the natural stone products are more random, varied and attractive. This is a personal choice, as many customers prefer the look of quartz, too. Personally, I love the look of the natural quarried stones. I have granite and travertine countertops in my own home and I love them. In general, quartz countertops start at about the same price as mid-level granite. Granite can be significantly less expensive than quartz in basic colors and standard textures, but in the rarer colors and with special textured finishes, granite can be somewhat more expensive. Things that should be remembered with natural stone: it should be sealed, you shouldn’t put too much weight on supported overhangs, strong bases and acids can etch the surface (use material specific cleaners), and care should be taken with hot pots and pans (use a trivet). Any countertop can scratch, but extra care should be taken with marble, slate and soapstone, as they are quite soft. Find the countertop that best suits your needs, your budget and has the appearance you love, because ultimately, it’s you, not your contractor or designer that will be living with your countertop choice in the real world!